Today, in Israel, is Holocaust Memorial Day. Here's an amazing story of an unlikely hero, a Christian who changed the world. Many of us have seen the Academy Award-winning film "Schindler's List," about how one courageous man rescued thousands of Jews from the Nazis. But there are dozens and dozens of lesser-known stories, including one of a man who led the second largest rescue of Jews during the Nazi era. Sugihara was recruited by the Japanese Foreign Ministry, and while stationed in Manchuria, was baptized into the Russian Orthodox Church--an unusual move for a Japanese. By 1939, with the Nazis on the march, Sugihara was assigned to the Japanese consulate in Lithuania. As the war raged in Europe, thousands of Polish Jews escaped into Lithuania. In June of 1940, the Soviets annexed Lithuania, and ordered all embassies closed. It was now too late for Lithuanian Jews to escape, but the Soviets agreed to allow Polish Jews to emigrate through the Soviet Union provided they could obtain the necessary travel documents. 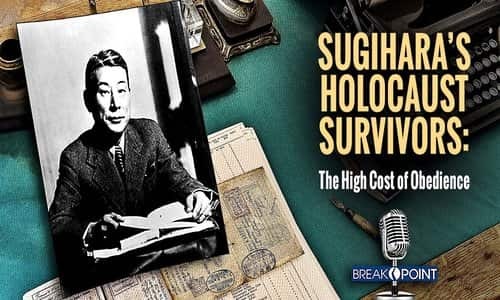 Sugihara and his wife awoke one morning in July to the sight of hundreds of desperate Polish Jews gathered outside the consulate--Could Sugihara grant them visas? Sugihara needed permission from Tokyo. At that time, the Japanese government would only authorize visas to people who had another visa for somewhere other than Japan. This was a nearly impossible qualification to fulfill, as most countries refused to accept Jewish refugees escaping Europe. Which is why, when Sugihara wired Tokyo about providing transit visas to Polish refugees, the government's answer was "absolutely not." Sugihara faced a difficult decision. If he defied his government, he faced the loss of his job, disgrace, and financial ruin--maybe even death. What would happen to his family? Sugihara told his wife, 'I may have to disobey my government, but if I do not, I will be disobeying God." Well, it did. Thanks to Sugihara, between six and ten thousand Jews survived. As sociologist Hillel Levine writes in his book, "In Search of Sugihara," "thousands of Jews . . . were packed on trains bound not for forced labor camps and gas chambers but for freedom." And today, there are some 40,000 descendants of those that Sugihara saved. In 1985, Israel gave both him and his wife its highest honor, "Righteous Among the Gentiles."